Lutheran World Relief (LWR) is an international non-profit organization that works with local partners to provide lasting solutions to poverty, injustice and human suffering. Through these partnerships, LWR strives to improve the lives of small farmers and their families, and to help them adapt to and mitigate the effects of climate change. The agency also provides emergency assistance such as natural disaster response (hurricanes, typhoons, etc. ), dangerous political unrest, and medical disasters and outbreaks. The goal is to help communities recover from disasters in ways that promote lasting improvements in people's living conditions. Learn more at www.lwr.org. 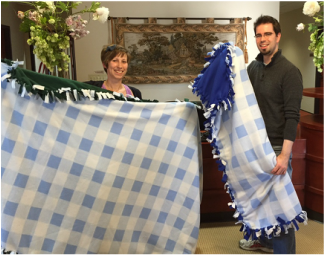 Christ Lutheran Church has long participated in LWR's Quilts and Kits program, which provides needed personal care, infant care, school supplies, fabrics and quilts to people in the areas that LWR serves. We are also a congregation that realizes how blessed we are and gives freely out of that gratitude when crises arise. In the last few years, we have provided financial gifts for Ebola aid, typhoon relief, hurricane relief and other disasters. In addition, the children of our congregation have given offerings to help people in developing countries to purchase livestock, seeds, and other commodities that help them to become self-sustaining. Our LWR coordinator at Christ Lutheran is Elaine Smith. Vicars Michael & Katharina display two of the 14 quilts that our youth and adults made for Lutheran World Relief this year.